Almost everything you use in doing your everyday tasks is manufactured. From the clothes that you wear to the computer that you use at work, these products were manufactured by companies. 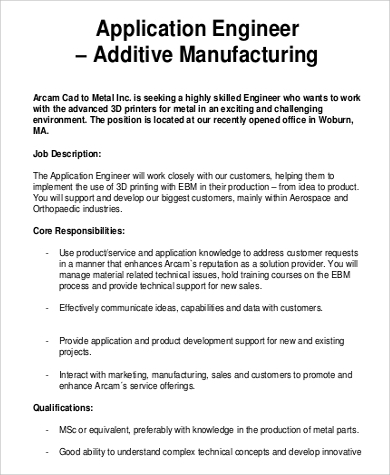 Manufacturing engineers play a big part in making this possible. From the planning of a concept to making them a reality, the manufacturing engineer is there every step of the way. Because of this broad scope of their duties, it is necessary to create a job description. 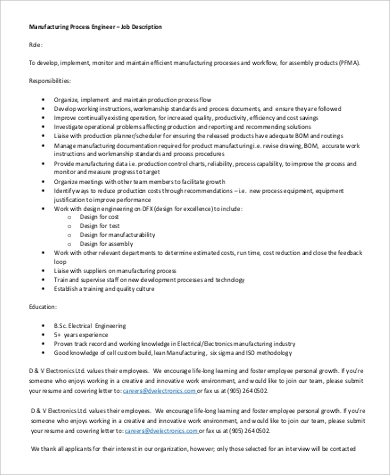 Our Job Description Samples perfectly captures all aspects that the job of a manufacturing engineer entails and they are very easy to understand. Engineering is a very broad industry to be in and it is important to focus on specialization to do their job effectively. 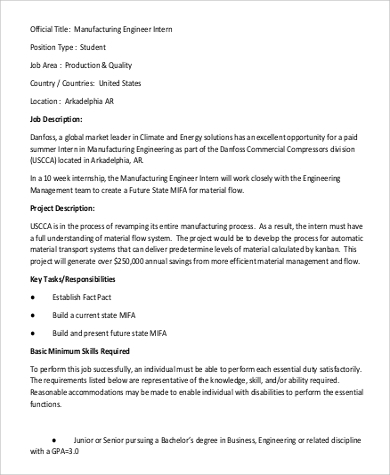 Mechanical engineers, for instance, have different sets of duties from other engineers and they are outlined in our Mechanical Engineer Job Description Samples. 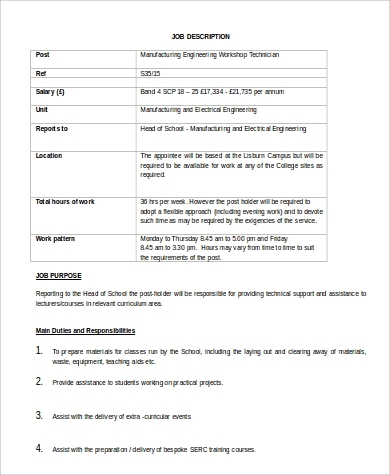 Manufacturing engineers also have different responsibilities from others. 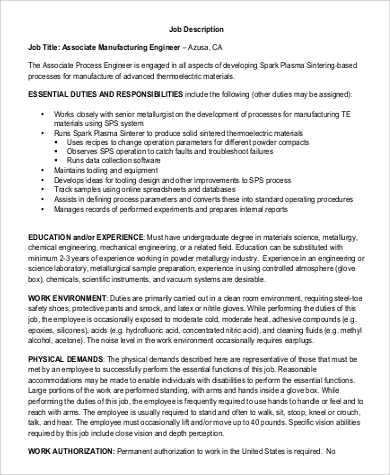 Here are elements found in a manufacturing engineer job description. 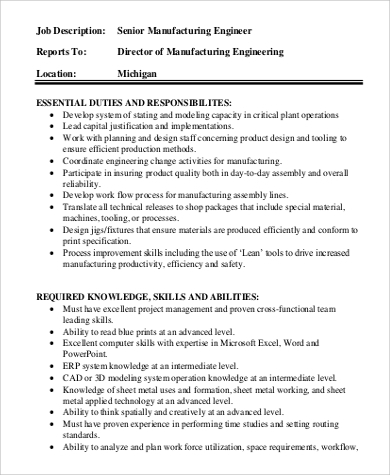 Job Title – State that this is for the manufacturing engineer position. Salary Range – It is best not to place here the exact salary but just the range. Start with the starting salary and work from there until the maximum salary. 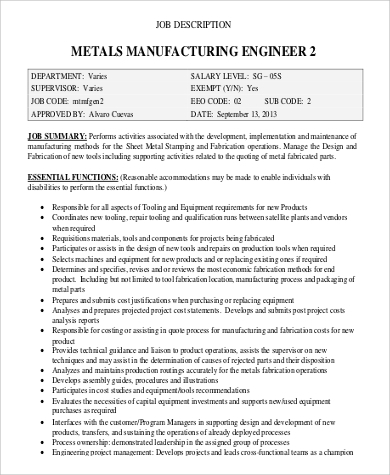 Purpose and Objective – State the purpose of having a manufacturing engineer in your company and the objectives of having one. 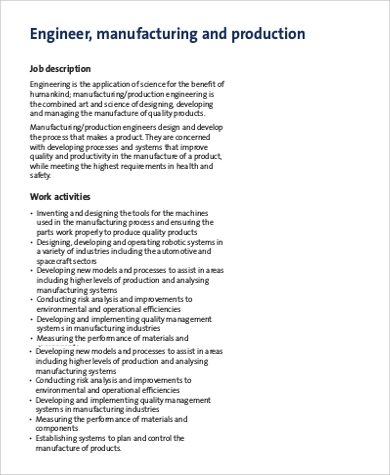 Job Description – Explain in detail what the duties and responsibilities of a manufacturing engineer are. Reporting Structure – State whether the position is a supervisory one and if it is, who are the people under it. Also state when the position has supervisors that oversee it. Experience and Skills – Explain the minimum working experience and skills needed to do the job. Work Location and Schedule – Indicate where the job location is as well as the hours needed. Making a job description is an important task that needs to be taken seriously. An employee, no matter how good he or she, will struggle with their given role when they don’t exactly know what they are supposed to do. Here are some dos and don’ts one should follow when making a job description. Do be specific. It is important to provide a detailed job description. 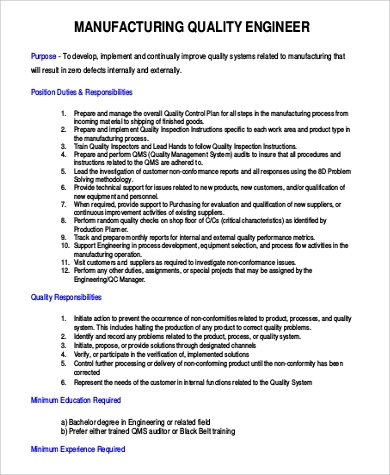 Network engineers need to check out these Network Engineer Job Description Samples while manufacturing engineers can check the samples here. To be sure there is no overlap of responsibilities, be specific. Don’t be unrealistic. It is a fact that there are job descriptions you see where you think is for three people. Be sure to think about the limitations of your employees and be realistic with the duties you write. Don’t use internal terminologies. You might scare away potential qualified candidates when you put terminologies in there that could not be understood by people outside the company. Manufacturing engineers do a great variety of tasks. It is important to outline them in a job description so that they know the scope and limitations of their job. 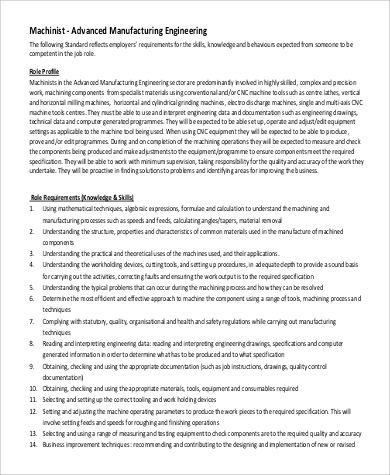 Our manufacturing engineer job description samples perfectly understands what this kind of job entails.